Here's 2 of my crash files. Whoever wrote that bug report guide has some very strange ways of using the file manager. Nope, just trying to make it newbie && non-techie-proof. Some folks get really confused pretty easy and just want step by step instructions that don't require any thought. Those that don't need or want that ▲ can simply glance through the instructions and do it their own way anyways. Sorry for getting this to you sooner. And thank you very much for taking time to help us. Cache clean had no effect, deleted that baked-batch file mentioned also did nothing. Any other suggestions. If you're not running from an SSD and you have one, move Subnautica to SSD (see appropriate line in my sig). I don't have an SSD sorry. Did you see anything else of note? Eh. Defragment your hard disk (SSDs don't need defragmentation, but normal hard disks DO). Windows should be doing this for you automatically, but perhaps it hasn't gotten around to optimizing the Subnautica files yet. and hit enter, then it will tell you how fragmented it was before and after optimization. The -v switch turns on verbose (extra information) mode, you can run it without that if you want. Does that affect it at all? EDIT: Oh, and replace c: with d: or whatever if you've got Subnautica on drive D or similar. I keep my C drive as a seperate partition of 50 gigs only for Windows and other core, vital programs ( Drivers, antivirus, etc ). Thankfully, one of the few decent things about Windows 10 is that it defrags automatically for me. Sorry to keep grilling you here, but any other suggestions I could try? You could try turning graphical options off in the F3 menu. You could try using the -force-d3d9 switch (outlined in the Direct 3D section of the Troubleshooting guide). The game often freeze for 3-10 seconds since I finished crafting the Cyclops (when I search for basics materials near the surface) and then crash. DxDiag found an accessibility problem with Direct Show that cause the application to crash when I launch DxDiag without specifying Direct Show as an exeption. Looks like my problem is pretty close to JesusChrist454s one. Unfortunately this had no effect. I imagine we're scraping the bottom of the barrel here for fixes, but is there anything else you'd suggest? Do you by any chance use gsync? No I don't sorry. After some research my monitor is not compatible with G-Sync without extensive home modification. Do you happen to have a gsync monitor with gsync enabled for both fullscreen and windowed mode? This caused a fps cap at 24 fps for me. When I switched back to gsync for fullscreen mode only, my framerate went up again. As I mentioned, my monitor is not capable of running G-Sync. It does not have it. Yeah. Wasn't sure exactly how GSync worked when the monitor doesn't support it (does it disable itself?). It's never there to begin with thankfully. Any more suggestions by chance? 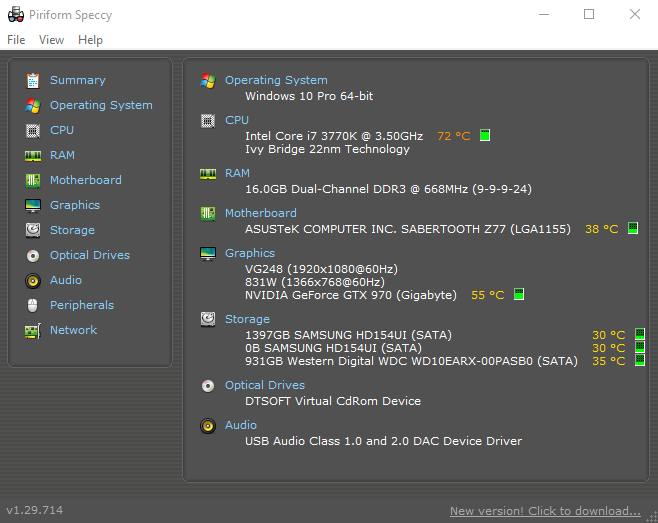 I can't remember if you've posted your complete system specs before (after a cursory glance through your posting history, I can't seem to find it). Can you post (or re-post) your specs using one of the tools in my signature (Speccy's probably easiest)? Had my game crash to desktop during normal gameplay today. Here's my "crash pack" of files as detailed by the first post in this thread. If it keeps happening I'll update my post. Also, strangely before the hardcrash above the game was crashing on exit. For my first crashpack I included the entire subnautic_data folder (woops). I re-uploaded the first pack with just the output_log. What are the chances of you treating yourself to an SSD? Extremely high in due time. I've had a lot of personal life expenses from emergencies and moving recently that's restricted anything but necessary expenditure for a few months. However, one of my primary hard drives is starting to fail after 15 years of service and Windows 10 takes over 5 minutes to startup and login. 10-15 second boot time with a good SSD (have personal experience with the Samsung 850 EVO (better, more $$$) and the Mushkin ECO3. I've heard the Samsung 960 or whatever m.2 SSD is like 4x faster than that though lol. Even so, I'm questioning if that's the only solution. I'm able to run multiple current generation games side by side at full graphics without slowdown ( EG: Titanfall 2, MechWarrior Online and Star Citizen ). Certainly, my setup has some problems, but no other games show it like Subnautica. I get the impression Subnautica still has a great deal of optimization left to go through. You are correct, they are going to finish up the new features and then optimize the entire thing before release. Good to know, thank you. Might just have to hang tight then.